Beginning in 2007, TIMA has produced a series of place based, limited edition, letterpress printed posters that reflect TIMA’s activities and the eastern coast of Maine. Twenty-three posters have been produced so far. Master letterpress printer, David Wolfe of Wolfe Editions in Portland, Maine has been responsible for the production and design of each of the posters. TIMA has also commissioned an artist to create an illustration for each poster or to recreate an existing illustration. 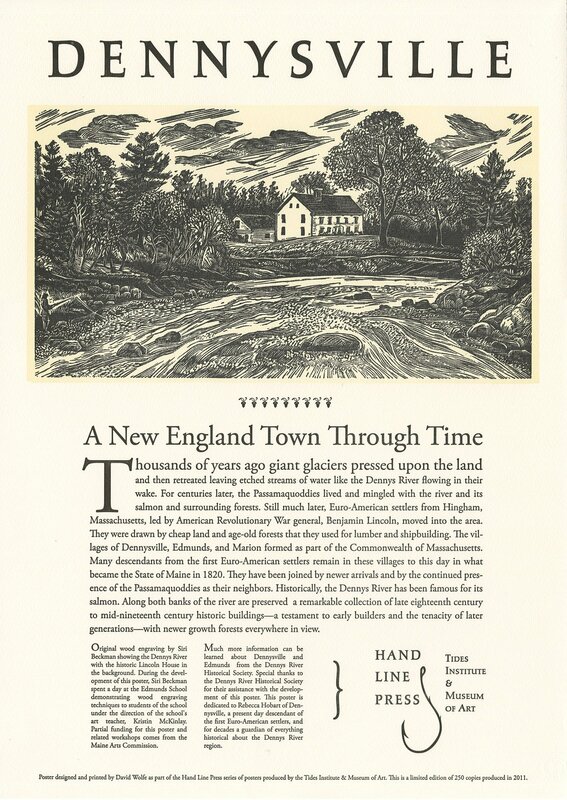 The poster for Dennysville, Maine, with an original wood engraving by artist Siri Beckman, and designed, typeset, and printed by David Wolfe can be seen below. The full series of the posters can be viewed through this link: Hand Line Press Posters. Copies of the posters are available for sale at TIMA’s main building or online.